Kawamoto Orchid Nursery is currently growing some differnt types of Vanda Orchids. 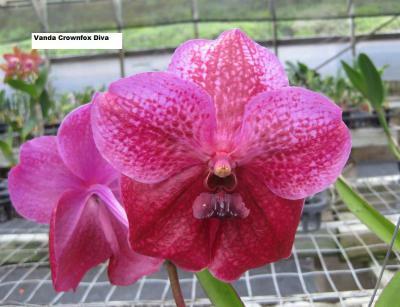 Please browse our Orchid Website for more Vanda Orchid listings. 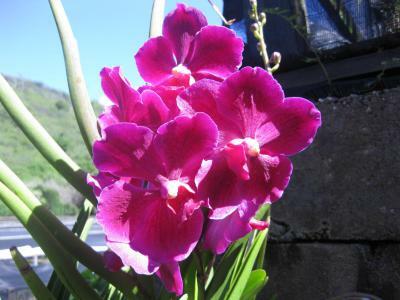 Vanda (VAN-da)- Vandas are captivating orchids that may be grown with relative ease. Vandas are vascular plants with monopodial growth habits, that grow upward from a single point. Growth arises from the crown of the plant. Flowers are available in attractive rich colors, including blue, red, orange and yellow. The flower spikes, which usually carry 8 to 10 blooms, arise from the base of the leaves and last for several weeks. Light- Vandaceous orchids require strong light. Provide full morning sun when possible. Semi-terete and terete types can be grown in full sun all day in tropical areas where the humidity is high. Strap-leaved plants need additional protection during the hottest part of the day. The plants need to adapt/acclimate slowly to any increase in lighting. Watering- should be applied frequently when the plants are in the growing phase, but the roots must dry quickly. Because of this, and their extensive root system, they are mostly grown in slatted-wood or plastic baskets, or in pots with a coarse potting medium. If their situation is warm and sunny (Summer months), they may need daily watering. Water less in the winter months when there is less sun and heat. 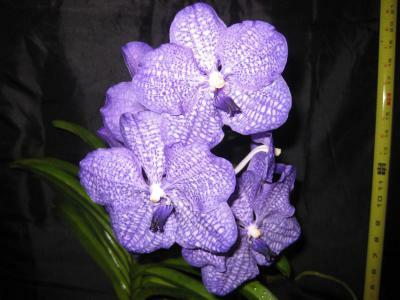 Temperature- Most vanda like it on the warm side, and do not like to go below 55°. Colder spells can be tolerated for a short time if it is not windy and wet. Optimum night temperatures are 60° to 70° F , and a maximum of 95° F during the day if very humid. Warmer temperatures mean faster growth, which must be balanced with higher humidity, air movement, and increased water and fertilizer. Days should be warm and humid for optimum plant growth. Humidity- Vandas prefer high 60 to 80% humidity. A high humidity is essential during the growing season, from early spring through late fall. During the summer, watering should be supplemented with daily misting of the leaves. Humidity Trays may be needed if your Vandas are growing indoors. Fertilizing- Vandaceous orchids require generous amounts of nutrients. Give plants in the greenhouse a solution of a fertilizer, such as 20-20-20 or 15-15-15, weekly during the growing season. Outdoor plants require a heavier concentration of the same fertilizer. During winter, when growth is slower, apply the same proportions every two weeks rather than weekly. In addition, substitute a fertilizer high in phosphorus (10-30-20) at every third feeding To remove built-up salts, flush plants with plain water once a month. Potting- Vandas can be grown in either a pot with large/coarse bark or in Baskets suspended by a wire. Plants grown in baskets do not need to be repotted often as those in pots. Vandas grown in pots should be repotted once every two years. Repotting should be done in the spring.